Located in the Western Hills Scenic Area, Badachu consists of eight temples, i.e., Chang'an, Lingguang, Dabei, Xiangjie and Zhengguo temples, Sanshan and Dragon Spring nunneries, and Precious Pearl Cave. The eight temples are scattered on Cruiwei, Pingpo and Lushi hills at the foot of the Western Hills of Beijing. 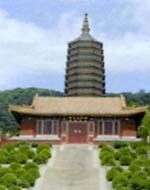 With clear springs and exuberant bamboo and trees, the temples are very appealing. It can be reached by No. 347 Bus.